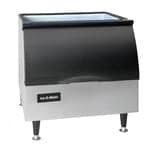 Maximize the performance of your foodservice establishment with a high-quality, durable commercial ice bin! CKitchen specializes in providing businesses with the very best commercial ice cube bins, no matter their size, volume, budget, or other specific needs. This addition to your kitchen will help ensure that you always have fresh ice on hand for serving, storing, and preserving food and beverages in your establishment. 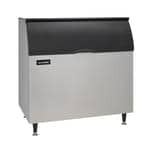 CKitchen.com prides itself on offering a great line of ICE-O-Matic Ice Bins. 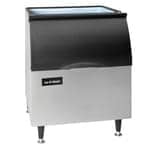 Ice-O-Matic makes unique ice storage bin solutions for virtually any combination of cube or flake ice makers. 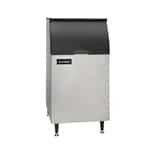 ICE-O-Matic Ice Bins are available either with a sloped front or as upright bins. Bin sizes range from 242 lbs (110kg) of ice storage to 1807 lbs (821kg) of ice storage. 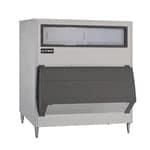 ICE-O-Matic Ice Bins are also available as high and low profile bins, ranging from 28" (711mm) tall to 66" (1676mm) tall. They are available in widths ranging from 22" (559mm) wide to 60" (1524mm) wide. 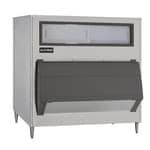 All ICE-O-Matic Ice Bins feature stainless steel exteriors, which offer corrosion protection and durability, as well as “Safe-Hold” hinge doors, which allow the door to stay open while scooping ice. Slope front bins boast a convenient scoop hook to store the ice scoop outside of the ice for maximum sanitation. 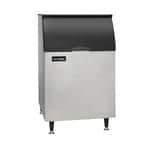 All ICE-O-Matic Ice Bins feature adjustable legs and are NSF approved. No matter your specific ice volume needs, budget limitations, or space requirements, CKitchen.com can help you find the perfect commercial ice bin for your unique environment. Our top priority here at CKitchen is to provide each of our customers with the best possible customer service, as well as high performing, dependable products. We are absolutely certain that you will be more than satisfied with any of the ice bins available on our site. 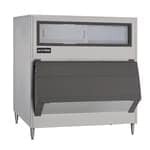 Shop our selection of ICE-O-Matic Ice Bins for the guaranteed lowest prices and fast shipping. Feel free to speak with one of our certified foodservice consultants who can assist you in purchasing the right ICE-O-Matic Ice Bin for your business.